View from the stage the 2016 Women & Automotive event. Photo by Jonathan Fredin. 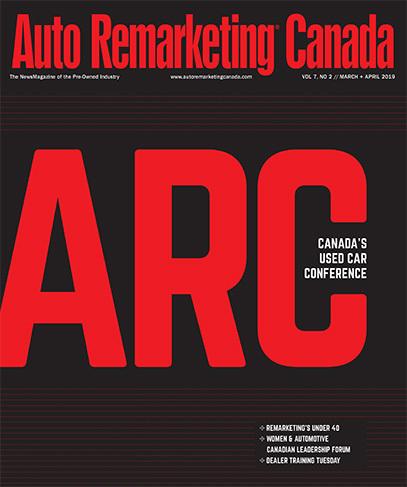 Auto Remarketing Canada has done it again! After a year of industry growth, they’ve built an innovative conference full of leaders and experts ready to share their knowledge and experiences. With the conference broken into three tracks this year — remarketing, retail and finance — dealers and associates will find it easier to navigate sessions. Personally, I’m most excited about sitting on a panel at the Women & Automotive: Canadian Leadership Forum on April 5. I recently connected with fellow panelists, Susan Gubasta (Mississauga Toyota) and Kim Miller (ADESA Toronto) to talk about the industry, career challenges and self-driving cars. There is no doubt that change is constant, and something both women spoke to when asked what they like about our industry as a whole. Kim Miller (KM): Without a doubt, the relationships. Despite all the incredible technological advances, the industry is still sculpted and driven by an incredible group of professionals. The automotive world is dynamic and fast-paced, which keeps me engaged in the constantly changing landscape. With any career, I believe it’s natural when faced with challenges to question your path. I asked both women about their careers and challenges they’ve faced. Both women shared humble insights and advice. SG: I’ve learned over time that we all have challenging periods in our lives and it is ok to question if what we are doing is right for us. I learned to not beat myself up and allow myself the time to figure out the answer. There is always a solution and I learned how strong I can be and finally gave myself some credit. KM: Challenging decisions are a reality, although it may seem cliché I truly believe the best decision are the ones where you are true to yourself. Self-driving cars, and technology is of course, a hot topic! It’s clear these women have a lot in common when I asked them what year they think they’ll buy their first self-driving car. SG: That means I have to give control over to the car … Correct? I love to drive, so once I get past that, I can’t see myself getting an autonomous vehicle for at least 10 years. Maybe by then I will be tired of driving! KM: For me…when I am unable to drive, until that time I enjoy driving too much. Susan and Kim are great representatives for women in our industry. With recruitment continuing to be a challenge that we face, I’m holding an open casting call for all change-loving, self-loving, and drive-loving females out there! I have to agree with them both when it comes to our industry, career challenges and love for the open road. I can’t wait to meet and connect with more women and men in our industry at the Auto Remarketing Canada Conference and Women & Automotive: Canadian Leadership Forum April 3-5! See you there! Logan Keirstead is Accu-Trade Canada’s regional account director and an honoree in our Women & Automotive: Profiles in Leadership. She is also a speaker at that conference. Keirstead can be reached at Logan@accu-trade.com or https://www.linkedin.com/in/logankeirstead.